Attending PAX East? Be sure to enter for a chance to win a customized Xbox One controller! Those among you lucky enough to be present at PAX East will have the unique opportunity to win your very own customized Xbox One controller, Microsoft announced Friday. In order to place an entry in the giveaway, PAX East attendees will have to snap a picture of their favorite controller and tweet it to @Xbox (be sure to include #XboxSweeps and/or #XboxOne in there as well). But you better hurry, there are only ten custom controllers available, and it’s unclear if/when they’ll ever be available again. 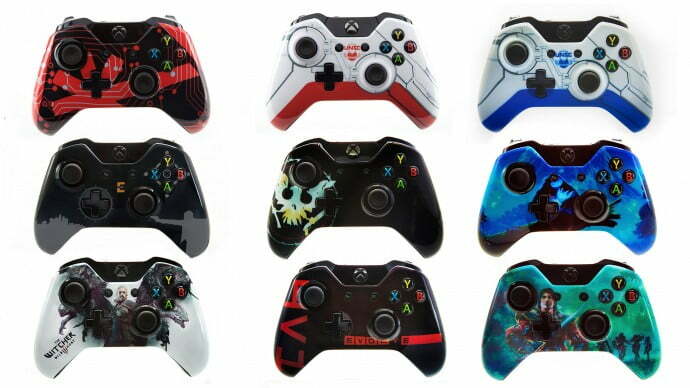 The colorfully crafted customized controllers (shown above) feature designs from Evolve, Halo 5: Guardians, The Witcher 3: Wild Hunt, Battlefield Hardline, and more! The giveaway also features Microsoft’s custom Witcher III: Wild Hunt Xbox One console, which is also showcased at their booth. You can also check out the complete set of rules and regulations regarding the competition here.